Braniff Barstools is a division of Braniff Enterprises Inc. We pride ourselves on treating our valued customers with care and respect. We pledge to earn and keep your trust. We value you as a customer and are here to provide you with the very best quality barstools, chairs and accessories possible. Your shopping experience and complete satisfaction is of the utmost importance to us. We value any input you might have regarding your online purchase experience and appreciate your comments. This will only help us to improve our outstanding service. Feel free to send us an email with your valued feedback. If you have any general questions or have requests for specific information, not already posted on our site, please feel free to email us at sales@braniffbarstools.com and we’ll be more than happy to accommodate your request. If you have questions dealing with any of our manufacturers and their warranties, shipping, or refund policies, just email or phone us, and we’ll get back to you with the information as soon as possible. On the occasions where we are asked to provide color charts or paint and texture samples, we will work with our manufacturing partners to provide these items for a small fee to cover their costs. We’re here to make your experience as pleasant as possible, and we want you to know how important you are to us. Contact us for mailing information. Braniff Barstools.com has taken every precaution to protect your security and privacy. 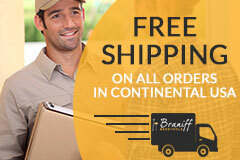 At Braniffbarstools, as well as any of the companies falling under the umbrella of Braniff Enterprises Inc., our goal is to make your shopping experience safe, convenient, and worry-free. All of your personal information is protected by our Secure Server Software (SSL) which fully encrypts and protects all of your personal data (name, address, credit card number) so that it can not be read by anyone over the internet. In technical terms, all transactions are fully secured utilizing a state-of-the-art, 128 bit encrypted secure server. Credit card information is never retained after your transactions are completed and all of your personal or email information is used ONLY for internal business use. You can feel comfortable knowing that your purchase is 100% safe and secure, and that’s a guarantee. At Braniff Enterprises, we are committed to protecting your privacy. You can feel confident that all the personal data we receive is kept completely private and strictly confidential and is protected against unauthorized access. Braniff Enterprises and any Division (Braniffbarstools.com) does not share or sell any of your personal information to/with anyone. NONE of your personal information is used for anything other than your barstool, chair, table, or furnishing purchase. We keep your information within the Braniff Enterprises, Inc. umbrella of companies. We will however use your email from time to time to notify you of any upcoming specials or closeouts, for follow-up information on an existing order, as long as you give us permission to do so. You have the option to opt-out of this service at any time. Any personal information we have is kept in the strictest of confidence. Quality is second-to-none here at Braniffbarstools.com. Our many World Class manufactures stand behind their products 100%. Their craftsmanship is among the very best in the business. You will not find better quality products than those offered by our elite class manufacturers. Based upon some of our manufacturers’ shipping preferences, a particular shipping company may be used. We will provide the particular tracking number for your purchase, as soon as it’s shipped. You will be notified by return email. At Braniffbarstools.com we have 5 ways to buy, allowing you the flexibility to complete your transaction in a way that’s the most convenient for you. Complete your secure order online. All credit cards accepted. Call us for wire instructions. We will send you an Invoice with the wiring instructions. NOTE: Your order will be processed AFTER the funds have cleared. Call us toll free for any needs at all. Let us know all of your requirements, or what you’d like to order, and if you feel uncomfortable including your credit card, check, or wire information, we’ll call you back to receive all the necessary information to complete your transaction. Please include your phone number in the email, so that we many contact you. We want to make your experience dealing with Braniffbarstools.com as pleasant and easy as possible. Thank you for considering us for all your seating needs.